Before he was running around as a chimp in Rise of the Planet of the Apes or Dawn of the Planet of the Apes, Andy Serkis was running around as a huge flippin’ gorilla. That’s right, the mighty and classic King Kong. Which continually reminds me that the man hasn’t completely evolved with the rest of us. All kidding aside, Serkis is hugely talented in the world of motion capture, and can bring something animalistic to life, apparently no matter what that is. In 2005, this film caused quite an interest in the media, as it was directed by Peter Jackson – most commonly known for his Lord of the Rings series. He clearly knows the world of fantasy and CGI, because King Kong is a lot of fun all around. Most of you are aware that this film is a remake of both a 1933 and 1976 film of the same title. I mean, it’s King Kong…he’s even battled Godzilla – the name isn’t exactly foreign. If you aren’t familiar with the story, it goes a little something like this. A very passionate filmmaker by the name of Carl Denham (Jack Black) is so adamant that his film be made, he escapes authorities in order to film on an undiscovered island called “Skull Island”. 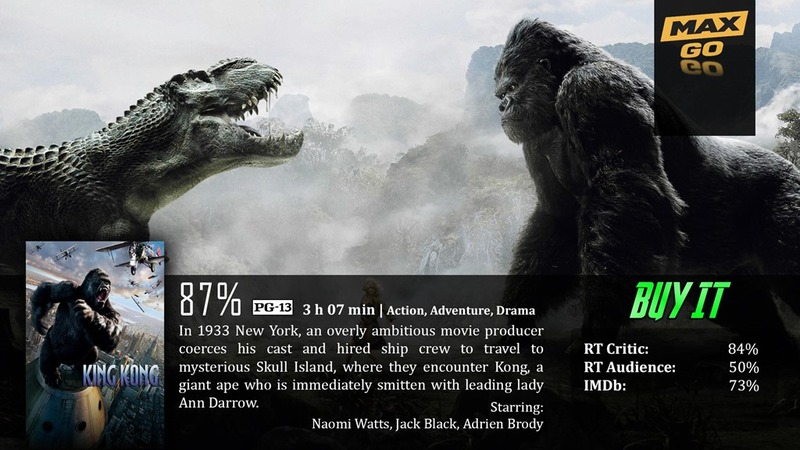 It is there that the leading lady of his film is taken captive by a huge gorilla obviously named King Kong. Their main mission is basically to fight through various monsters to get her back. Keep in mind that I have no real knowledge about the classic films other than to say the basic plot stays true to the originals…I’m sure there are added details here and there, as this is the longest film…but I do know certain scenes throughout the film are borrowed from the older movies– as well as the same character names…that’s the extent of my knowledge. It’s not really going to bug me to be that precise in my review because I don’t care. This, to me, is a standalone project capable of standing on its own two feet. And stand it absolutely does. First of all, the obvious details people are going to worry about is length of the film. Whenever you have something over 3 hours, people are going to wonder if its ultimately worth it. In my opinion, absolutely. Peter Jackson has the strangest way of making a long movie more than bearable – by filling it with both captivating and breathtaking scenes. Whether that means visually speaking or action, King Kong has both. The set designs are pretty impressive, as is most of the CGI. CGI is hard to get perfect because our technology is always advancing. In 2005, this film looked insanely good, and that holds true today…for the most part. There are moments here and there where you’ll say…yeah…it could definitely use a tune-up in the graphics department, but close-up shots of King Kong are still very detailed. It never sucked me in to the point of really believing this was more than just a production, but even so…it’s a fun production. The scene with the bugs is still nerve-wrecking, vomit, and nightmare-inducing. It just makes your skin crawl – and to think something similar was in the original film is really awesome (the scene was destroyed after horrified audience members left the theater). King Kong is an epic action and adventure film that may feel a little too much like just a production, but it’s done so incredibly well that you won’t care. It’s just a lot of fun to watch. No matter how good or bad it is, it is still three hours long, and that is definitely something people avoid. I admit…I saw this once, maybe twice the year it came out, but haven’t since. Our brains are just hardwired to think we have better things to do…and sometimes we do. Also, as far as plots go, this felt a little too close to Jurassic Park than I’d like to admit. It took the CGI team longer to build the Empire State Building in CGI than it took the construction team to build the actual building. Cool review. I really like Jackson’s version. Of all the King Kong films this one best portrays the relationship between Kong and the girl. Therefore, I did feel it was not just a mere production. It has plenty of heart. As for the length, I thought everything up to our arrival on Kong Island dragged mercilessly. PJ could’ve cut that part in half and had the same movie. The rest of it flies by, so all is forgiven. In short, we both love it, just for different reasons. Great review. It’s the big bug attack that always spoils this movie for me. I skip right over it. Ridiculous. Still, it has its charms and King Kong the ape is great to look at. The bug attack is a classic, controversial scene in the original film that was removed after people left the theater traumatized…and I love Peter Jackson re-imagined it. I was brushing my body off for imaginary bugs all night. Thanks for the comment! Don’t get me wrong, I still love Jurassic Park, but the technology there is now twelve years old. Peter Jackson’s KING KONG is the experience for which movies were invented. The CGI was incredible, the casting appropriate (this wasn’t supposed to be an actor-driven, big-star film, after all), and the flow was satisfying. Even the somewhat slow build-up had a huge payoff once you see Kong running through the jungle with Ann in his giant hand. Is it a flawless movie? Probably not. But it Is a perfect example of why we go to movies in the first place– to see things that we will never see in our real lives. When I walked out of the theater and was making my way through the deserted lobby, I had an odd feeling. Every poster I saw for an upcoming film kind of made me feel like all those movies were probably just going to be a waste of film next to KING KONG.